How Conscious is Conscious Business? Conscious business and spiritual marketing are all the buzz these days, especially among women entrepreneurs, and that’s a good thing. Previously nobody cared a hoot about anything in business but the bottom line and brainwashing people to buy stuff. Now there is a growing sense that business should be more human, that we should be doing good works through our businesses and our marketing. And I really honor that. So here’s the rub, and I hope I am not the only white girl noticing this: the conscious business movement lacks diversity. Without naming names, I just want to say there have been several spiritual business and marketing type events in the past year with multiple experts in tow who are almost exclusively white. Could it be that these women who have spent years doing their inner work, culling out negativity and denial, facing their demons, and owning their stuff, don’t notice that they’re only promoting and listening to Caucasians? Do they believe that white women have the corner on Wisdom? Considering that all the significant progressive movements in the US during the past 200 years have been started by Black people, and that everything cool and original in white culture originally had a Black, Brown, Yellow or Red face, it’s hard to believe that us progressives could be so color-blind. I have been secretly growing more and more despondent at this, not knowing what to do about it. Personally, there have been years of my life where I found myself in rather segregated situations where hardly a Black or Brown face could be seen in the crowd. Our culture has done a lot to separate us. But do we really need to carry this segregation into the conscious business movement, my friends? Now, I have to own up to something here. I was as guilty as the rest of them. A few years ago I started writing a book where I was interviewing all sorts of experts on how to have a “Client Attraction Breakthrough.” To be honest, I had interviewed about 15 people before I noticed all the folks I’d interviewed were white. So what did I do? I created a different Attraction Plan, and things started to change. The Universe is a powerful thing. I had only called two people with my intention to attract more Black women and specifically Iyanla Vanzant when I got a voicemail from Iyanla herself requesting a website. (No, she didn’t know the 2 people I spoke with, the Universe sent her!) Long story short, creating Iyanla’s site has attracted a flurry of powerful women-of-color to me, and I am elated. It’s great that I get to help these brilliant women-of-color share their important missions with the world. But this is only a first step. The next step for me is going to be organizing the most diverse spiritual marketing event or radio show in the history of the Internet. I’m not sure of the form yet, but I want to ask for your help. If you know of someone of color who has an important message for our movement, who knows some business and marketing strategies that can really help conscious business owners to expand, and who has been overlooked by the popular spiritual business gurus, please post their name and website address in the comment field below. Feel free to submit the names of anyone of any race you feel has an important yet overlooked contribution to make to conscious business. I will be collecting names as I start to plan this event for the 2013. 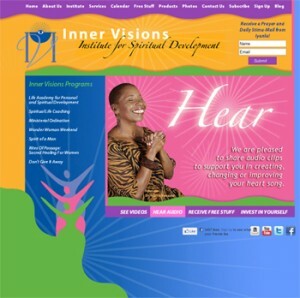 Join me in bringing some Color Consciousness into the spiritual business movement now by joining the conversation. Good for you, Julia! I, too, think this is a critical issue. I just finished a book project where I made a special effort to create both geographic and ethnic diversity among the experts I featured. Here are some of the folks I included, in case any of them would work for the theme of your next event. PS: And kudos to you, CJ for making your book a diverse one. Please let us know when the book comes out. I will do what I can to support you. Thank you for the acknowledgment, Julia! I remember meeting you at a Bay Area networking event maybe as much as 15 years ago. The new book was just released: 50 Ways Coaches Can Change the World. You can check it out at the site linked to my name above. Best wishes to you in all you do! Julia, your tenacity, creativity, and professionalism has blended well into genius. (I’m usually impressed when someone knows who Sojourner was–and will embrace her.) You will do well with this..my practice has virtually become 60% as I’ve spent (sent) the intention to the world of color. All are ready to see my health care is true and far from the insane medical world. IF you need anything, feel free to call. 912-227-2747–> I’m proud to be in your company. ~C –> Good for you! and Thank You! Dr Cathy, thanks for your support. 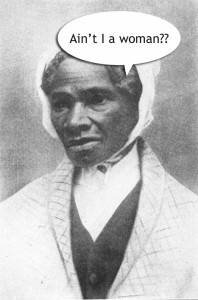 I know quite a bit about Sojourner Truth and studied her as a philosopher a while back. We have a lot of folks changing their names in the Bay Area to match their philosophy more closely. Well, Sojourner Truth did that over 150 years ago! She took her whole philosophy in her name, saying, “I will sojourn the world and tell the truth about democracy, that is doesn’t exist for Black people in America!” She was one gutsy woman, and proof that a small group of people with the right idea can transform the world. Great article about an important issue. Thanks for bringing it into our awareness! Indeed you’ve spoken your truth with courage and commitment. I applaud you for bringing attention to what I also perceive as a huge and unfortunate gap in the conscious business movement in terms of on-line events like tele-summits, that don’t appear to be inclusive or diverse in terms of featured speakers. I applaud your commitment to attract and feature conscious women of color, capable, brilliant and worthy, with great wisdom and gifts to share; women (and men) of color who are making significant contributions to the transformation of people and the planet. Brava and Blessings! Also, thanks so much for including my beautiful website HomePage with your article! Thanks for your comment Harriet. I appreciate your support and your comradery. As always! I appreciate you for sharing from the heart. You have poignantly and passionately begun to address and important matter – Diversity in the Conscious Business and Spiritual Marketing community. For you and the good people/industry colleagues posting comments, I am open to exploring purposeful partnerships and invite you to contact me. I am creating my website and developing expert offerings in the realm of Gardening, Health and Spirituality. The website in progress is http://www.thesankofalady.com. This is just one focus of my work, to begin. I am excited and grateful to be on this expansive path of greater global service. Julia, look for my personal message in your email inbox. I look forward to furthering our connection. Leia, I’m glad to hear from you and looking forward to talking soon. Thanks for your comments here. I appreciate your enduring support.